Dragon Lines was the debut online slot release from Australian slot developer Ainsworth in April 2013 after a successful period as a popular land-based slot in casinos around the world. 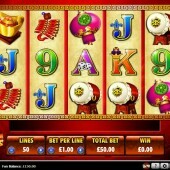 The 5 reel, 50 pay-line slot comes with an array of symbols that highlight the slot’s oriental-theme. Symbols across the reels include dragons (obviously! ), Chinese lanterns, gold medallions, firecrackers and Ying and Yang symbols. The dragon symbol conveniently acts as the Wild symbol in Dragon Lines and substitutes for most other symbols to complete winning combinations. The only symbol it the Wild does not substitute for is the Ying and Yang Scatter symbols. The Wild also only appears on reels 3, 4 and 5 during regular game play. 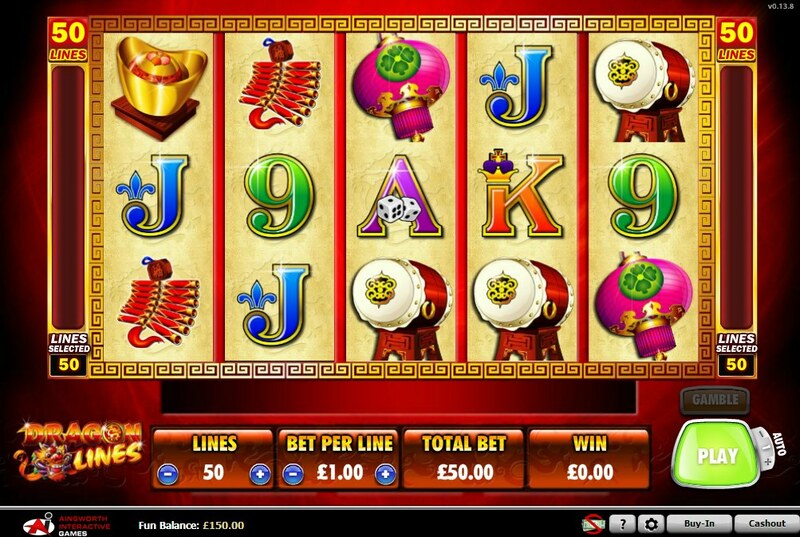 The main bonus feature in Dragon Lines is the free spins bonus round. This feature is triggered when you hit three or more Scatter symbols across the reels. You will be instantly awarded with 10 free spins. Additional free spins can be triggered if you hit three or more Scatter symbols during the free spins and this will reward you with an extra 5 free spins. The Wild symbol is also present on reels 2, 3 and 4 during the free spins so watch out for this to avoid confusion. Dragon Lines takes on a very similar vibe to the hit slot release 50 Dolphins by Ainsworth and the 10 free spins is given an extra edge by the fact that the Wild symbol can become a Stacked Wild during the free spins. Players that have played the thrilling Roaming Reels or the African-themed Safari Spirit will want to check this slot out purely because it was the pioneering online slot release from Ainsworth for a reason. They wanted to hit the online market with a bang and in Dragon Lines they did just that.